(XL) Mens Vintage Western Shirt! Black w/ Metallic Silver & Gold Stripes! 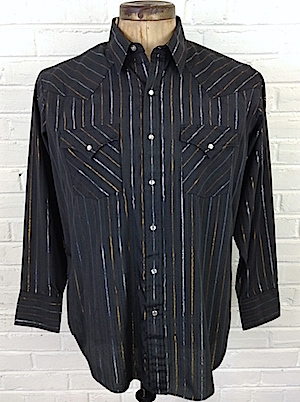 Home > Items just added 4/3-4/17 > (XL) Mens Vintage Western Shirt! Black w/ Metallic Silver & Gold Stripes! Mens vintage Western shirt! 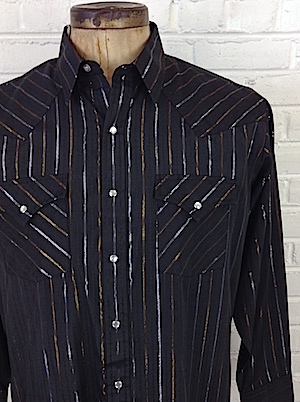 Get your cowboy on in the black Western shirt with silver and gold metallic stripes! Closes in the front with pearly white snaps with three matching buttons on each cuff. Two patch pockets on the chest, each that closes with a pointy flap and snap closure. Shirt has a tapered hem. Tagged by Ely. No material tag, but feels like polyester/cotton blend.